(CNN) - Herman Cain said he made a mistake Tuesday when he said he could see himself negotiating with al-Qaeda if he were elected president. "I misspoke," Cain told Anderson Cooper immediately following the CNN Western Republican Debate in Las Vegas. "Because I didn't, you know, things are moving so fast, I misspoke. I would not do that, I simply would not do that." Cain made the original assertion in an interview Tuesday with CNN's Wolf Blitzer. Blitzer asked if Cain would be willing to negotiate with al-Qaeda by releasing all of the prisoners at Guantanimo Bay. "I could see myself authorizing that kind of transfer but what I would do is I would make sure that I got all of the information, I got all of the input, considered all of the options and then, the president has to make a judgment call," Cain said. Cain said after the debate that he was confusing two situations, since a previous question had been whether or not Israeli Prime Minister Benjamin Netanyahu had done the right thing by releasing hundreds of Palestintian prisoners in exchange for the release of an Israeli soldier. "Here is how I was misspeaking about our situation," Cain said. "I said Prime Minister Benjamin Netanyahu had a lot of things to consider in order to make that decision. What I'm saying is I can't say he did the right thing or the wrong thing just based on the numbers. That is the point I was trying to make. I probably misspoke when I went from that situation over to this situation. You got to have all the facts." Cain also said after the debate that he was fully prepared to compete in the early voting states of New Hampshire and Iowa, despite reports that he wasn't serious about winning those states. "We have a staff of about three people in New Hampshire, and we're in the process of adding more people in New Hampshire," Cain said. "The other thing is we are raising money, we got money to stay in this race. People are saying we broke now." Cain continued, "We are hiring people for our corporate office and in all of the states, we are ramping up. The good news is, plenty of good people out there and we are adding them very rapidly. We're in it to win it." Pizza Man seems to misspeak quite often. Goodye Hermie – perhaps you can have a singing career in the future. I am actually surprised that these people are contesting to be AMERICAN president WOW, what a degeneration!! Just goes to show, they don't always hear all parts of the questions. I don't know if he can win, but he sure makes me feel confident in how he would serve the country. He keeps saying, "I got" and "we got" and "you got." There should be a "have" in between all those pronouns and verbs (i.e., "I have got" and "we have got" and "you have got"). Call me picky, but I believe the President of the only Super Power left on the planet and leader of the free world should be able to speak English correctly. He should stick to negotiating pepperoni vs sausage. How in the world does he keep 2nd place in the polls? "I misspoke," – What a Dope!!! "Because I didn't, you know,"
"...things are moving so fast,"
Dang, I fell on my ASH! "I would not do that," – that would be wack!! "I simply would not do that." Damn – can I take it back??? People are saying 'we broke now'. Herman Cain is a man out there with some excellent ideas, leadership qualities and straight talk with the courage to enter a completely new realm ( national politics ) because it's obvious the national political realm needs help. The administration stopped being about the people long ago. It is self-focused and intent on driving a wedge through our nation in a last-ditch effort at survival. It is pathetic. 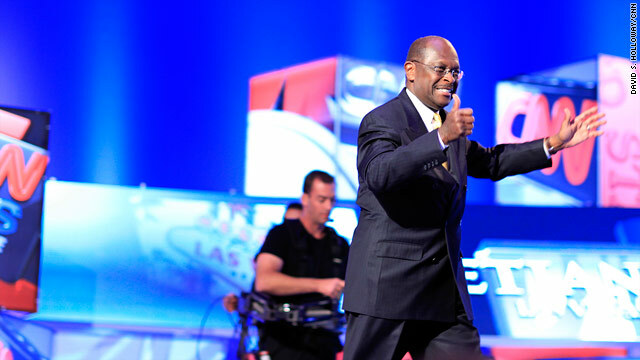 We need a Herman Cain in Washington. It has to come back to the people and give the politicians a rest. Americans need leadership with a purpose again. That's Ebonics – I wonder how he would answer this – "Do you believe Ebonics exist??? And if you do, how would you end it?? Do you feel these same people are brainwashed?" I am sorry but I have to agree, I don't want someone that can't even speak english to represent this country! You sound like you should be hanging out with the "Occupy USA" folks!!! Truthfully, that's a good thing. Too bad this is just part of your blog. Obama's ego would never let him admit he was wrong. That's why he is intent on blowing another $450 billion of our money on the same failed 'jobs' strategy that gave us 9.1% ( official ) unemployment. I would rather see someone honest enough to admit they made a mistake rather than making the same mistake again in a futile attempt to justify the first one. What with these politicians? They said nonsensical things which they thought would at least catch on, but as soon as it doesn't they 'misspoke' The word misspoke is so overused by these people and one sometimes wonder if they know the meaning of misspoke. Cain seriously said he would build electrified fence to kill innocent people who are simply crossing over where the grass is greener. All of sudden, he was making joke. He seriously said he would negotiate with terrorists. All of a sudden he misspoke. We simply cannot trust double minded men like Romney, Cain and Perry to be president. They talk too much trash, then simply pass it of as a joke and a misspoken moment. The republicans are still searching desperately among a bunch of old men and one female bigot who has no idea of what is takes to be president. ha...I bet you Cain is taking the TP for a ride. It has to be it.